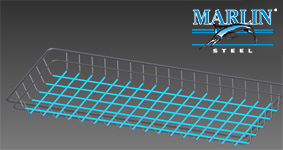 As the only wire fabricator in the USA with this software program, Marlin Steel Wire Products stands at the forefront of engineering solutions. The Marlin Steel Engineering Team can perform a Structural Stress Analysis to ensure that your products will perform as intended in a defined load environment. Our Software Stress Analysis can help you anticipate possible failure modes and design against them. Pursuant to our analysis, we can suggest the best materials for your parts or components. The Marlin Steel Engineering has the horsepower to Solve your Engineering Problems with our Component Stress Modeling and Simulation. For example, a steel wire basket design was subjected to our stress analysis. In this analysis, the top of the wires and sides of the top frame were subjected to a fixed constraint simulating the basket being lifted. A 25-lb. load force in the z-direction was placed to determine the effect inside the basket. The basket would fail in this case if it experienced movement of more than the width of a human hair. With the simulation being completed, we are able to anticipate such failures ahead of time and redesign the basket in question without having to waste materials on tooling for and manufacturing a prototype. Ultimate failure, rupture or collapse due to stresses exceeding the material and structural strength of your product. Detrimental yielding that undermines structural integrity or performance, due to stresses exceeding material yield strength. Instability (buckling) under a combination of loads, deformations and part geometry. Fatigue of material due to crack initiation and propagation under cyclic loads, and fracture due to unstable crack propagation. Elastic static or dynamic deformations causing loss of function, preload or alignment, interference and undesirable vibrational noise. Other time-dependent material failure modes including creep, stress rupture and thermal fatigue. Marlin's Design Stress Software Analysis can be used to refine a given simulation continuously until a convergence value is seen, especially in the high-stress concentration regions. During Simulated Operating Conditions Testing, the number of refinement steps and stop percent threshold criteria can also be refined to produce a more accurate result. Our Metal Stress Testing Software results are evaluated by our Engineering Team enabling us to recommend design improvements. One example might be a larger fillet radius (to smooth edges and lower stress concentration). We can provide documentation outlining the strengths and weak points in your parts or components. Our team recognizes the need for the analysis to be conservative, using a predicted failure load anticipated to be less than the actual load your components can withstand. This compensates for uncertainties caused by analysis assumptions and the variations in the applied loads. Marlin's engineering design team can help you to enhance your safety factor (SF), as we anticipate uncertainties and the limits on loads are increased in proportion to the SF. The SF requirements may change depending on the responsible application for your products or components. Conceptual and Preliminary Design phase. Sizing and checking of load paths. Simulate structural testing to create the required minimum response (usually 1.25 times the limit loads). Demonstrate that anticipated extremes will not cause structural damage or detrimental yielding.